Cost per night 15 Please note prices are just a general guide. Levuka has been Australia's best kept secret for the past 15 years. 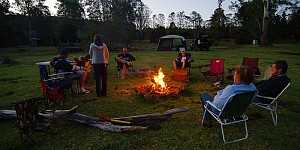 From our camping grounds, enjoy spectacular views across the valleys. 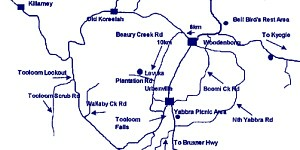 Levuka is situated on the south-western edge of the "Scenic Rim", an ancient volcanic formation. 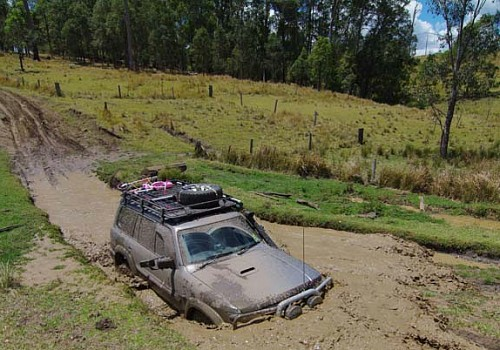 Levuka offers "soft driving" on a range of tracks graded from easy to extreme. We aim to give challenging driving without doing excessive vehicle damage. Tracks carry an approximate grading, however those grading will increase by two to three in wet weather. Our commitment to environmental sustainability is genuine and tracks will be closed in wet weather if degrading has occurred. Special areas have been set aside for groups with full rescue equipment. Under development is "Old Nicks Nest", a grade 5+ network and a rock gully crawl that will follow Bull ant gully. The waterfalls and significant "Old Growth" trees are within easy walking distance of roads. Part of our nature base is the World Heritage and National Park areas and the opportunity to go spot-lighting at night. Some of the species found at night are Antechinus, quolls, phascogale, glider possums, sugar gliders, koalas and lots of bandicoots. Two hundred and seventy species of birds have been identifies along Beaury Creek. Many are very rare or endangered species we also have in abundance of spiny echidna, wallabies, eastern Grey kangaroos dingoes. We also have many rare orchids and mammals as well as "Old Growth" rainforest. One third of the property has been preserved and we have a low impact, sustainable farming policy. Some significant ancient trees are within walking distance of the camping grounds. A stand of Ridge Oaks had been preserved and flocks of Red Tailed Black Cockatoos feed in those trees when the acorns are ripe. We have also preserved our old tree hollows for bird breeding sites. Future plans include a water bird breeding area and wet-land restoration. There aren't any reviews yet for Levuka 4WD Park.